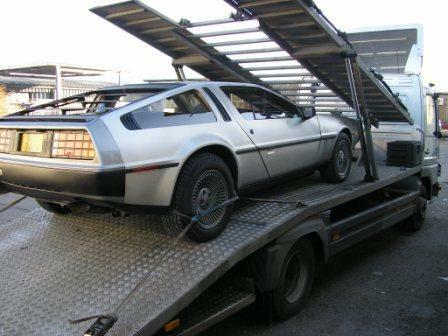 This page is focussed primarily upon buying and importing your DeLorean into the United Kingdom. However, much of the process is similar for other European countries. Please ensure that before importing, you check the relevant laws and guidelines for your country. When the DeLorean DMC-12 cars were first built – all but a few were exported from Northern Ireland to the US – where the vast majority remain to this day. Conservative estimates suggest that of the 8,950 cars built; around 6,000 are still in existence – mostly in the US. Therefore, it makes sense when looking to purchase your first DeLorean (or maybe your second or third!) to consider your options ‘Stateside’ as well as those available within Europe. This article is intended to provide a high-level overview of the automobile export / import processes from the US to the UK and to highlight some of the potential pitfalls faced along the way. It should be noted that this is a fairly complex process with lots of legal red tape, so it is always advisable to carry out your own research where necessary. If in doubt, seek professional advice – and don’t hesitate to utilise the services of HMCE (Her Majesty’s Customs & Excise), the DVLA (Driver & Vehicle Licensing Agency) or a professional transportation company. Each year we import a number of DeLoreans from the US into the UK for restoration and subsequent sale. This has given us a breadth of experience in this area – ranging from importing ‘basket case’ cars worth as little as £1,500 to high-end rare cars such as Pilot 20. OK, without further ado, let’s walk through the process of getting a car imported in a chronological order. The most common method of buying a car from the US is via online auction websites such as eBay (www.ebay.com). (c) You take a punt, send the money ‘blind’ and hope what arrives at the docks is what you expected! Another alternative is to buy from a US vendor and have the car shipped to the UK. This guarantees a higher degree of quality in the car you buy – and in some cases a warranty (although these aren’t worth much if the seller is 4,000 miles away in the US). However, this option is also the most costly – and would exclude a large number of potential ‘first time’ would be owners. The last suggestion is to purchase a car from within the DeLorean community – e.g. a car that is known to US club members who can give you a bit of history on the car before you commit. However, beware that within any club there will often be a degree of loyalty/friendship between members, so you may not always get told the full, frank details of the problems on a car! The onus is always on the buyer to make their own checks and to ask the right questions. It would also be sensible to check out the DeLorean Chronology (http://www.dmcnews.com/faq/n_chron.htm) for any history on the car, and to obtain a Carfax report on the ownership history. TOP TIP – Look at where the car is located on a map in relation to the main port authorities (New Jersey, Florida, and California). A car in a landlocked state such as Colorado will cost a lot of money to transport the many miles to the port. DOES THE CAR HAVE A VALID TITLE? This is absolutely critical – because exporting a car from the US without a title document is quite tricky. For reference, the title is the US equivalent of the V5 logbook issued by the DVLA here in the UK. 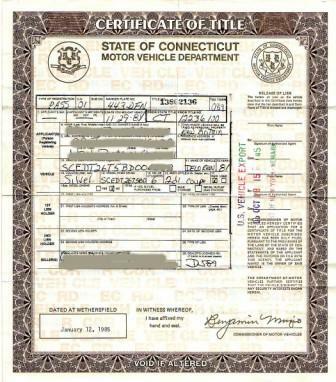 The image above shows a Connecticut title document (from pilot 20) – with some of the previous owners details. Note the export stamping on the right of the document. This is done once a car is cleared through US port authorities and can legally be exported. Shipping without a title is possible – but should be avoided (as unless there is a good reason why the car doesn’t have a title – don’t spend your money! The US system is designed to curtail organised car thieves – and ensures that only the registered owner of a vehicle can legally export it outside the US. A car without a title can still be exported – but it’s a very fiddly process – and outside the remit of this article! But once you have established that the car DOES have a title document, the next document you will need from the seller is a BILL OF SALE. The bill of sale document is essentially a receipt – but more importantly, it is used as an official document to show that you have purchased the vehicle (and you now have the title to prove it). 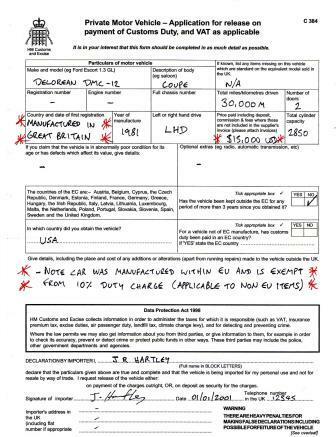 The document also shows the price you paid for the car – which is used as a market value for calculating VAT once the car arrives in the UK. TOP TIP – Ideally, do not pay in cash, as this is not easily traceable in the event of a dispute. Where possible, use a cheque, draft or credit card as these will formally record the transaction. Some sellers may allow you to pay with online merchants such as PayPal, although these typically charge the seller an additional 4% in fees which they may want you to pay for! It is critical that you obtain a written receipt called a Bill of Sale. This applies to cars purchased from a dealer or from private individuals. The bill of sale must clearly state the date, what was purchased, who sold it, who bought it and the price paid. It should also bear a signature of the seller if possible. TOP TIP – at times of severe exchange rate fluctuation, it may be to your advantage to have the bill of sale written out in your home currency (e.g. pounds sterling). If the value is given as a US dollar amount, HMCE will use the prevailing exchange rate to work out a sterling value upon which to base the 17.5% VAT. This is especially applicable to high-end imports where a couple of percent can make a worthwhile difference. DO NOT be tempted to reduce the value you actually paid on the bill of sale (this is referred to as a ‘write down’) as this is effectively fraud – and you could get a big fine or potentially a prison sentence. Remember that HMCE do this for a living and they see hundreds of cars being imported every day. Any tricks or scams that you could dream up will have been used countless times before – so just be honest and if you prepare your budget properly – there’ll be no need to worry. (b) injure the poor unfortunate who opens the container doors back in the UK! It is always best to have this work carried out in the US prior to getting the car shipped. Some transporters will allow you to ship a car without brakes – but will hit you with a big premium, and then they’ll try to lash the car down as much as they can and hope for the best. The same applies to steering – the car needs to be able to steer – so it could be pushed into position. Don’t forget, the DeLorean is a 1.5 ton car – it’s not much fun pushing these things onto trailers or into containers! (b) Pay for a managed service which includes everything (except VAT and duty). Our recommendation is always to go for option (b) – the managed service. The transporters do not make any real mark up in handling the port fees, etc on your behalf – so take advantage of their expertise. Typically, unless you are a real expert in the import business – you’ll tend to get cleared a lot quicker through a regular agent than if you try to go it alone. Much of the customs clearance is sped up by the excellent relationships these transporters have with their counterparties – and you will find that your car will be cleared far quicker by the shippers than by you alone. Expect to pay around £1300 to £1500 for the transporting and UK port fees (subject to where the car is located). It’s always cheaper to ship from the USAC (US Atlantic Coast), purely because of the lesser distance and established shipping routes. There are two main methods of shipping. Container or RORO. Container is by far and away the most practical. Essentially your car will be placed in a 20 foot enclosed cargo container (lashed down of course) and then treated as bulk container freight. The option RORO stands for ‘Roll on- Roll off’, which as the name suggests is where the car is driven onto a ship and driven off again. This is more common for short European Ferry journeys. It’s not something we’ve ever used for Transatlantic voyages – and there’s no real cost saving this way. Another consideration to bear in mind is where in the UK the transporter can ship to. Most transporters will ship to Southampton or Thames Port (Chatham, Kent) with a few also offering to ship to Felixstowe in Suffolk or Liverpool. Although the shipping costs may be marginally higher between transporters – the one that can deliver closest to where you live is often the best option – as you can save some money on the local transport costs (often around £2 a mile). Cars are shipped on a ‘CIF’ basis, which stands for ‘Cargo, Insurance & Freight’. This effectively means that you are the legal owner of the cargo throughout it’s journey. The significance of shipping under CIF means that you legally hold title throughout the car’s journey. If you were to subsequently change your mind, or have a dispute with the seller, you are still liable for the import taxes. Step 4 – Get the car on the boat! First you need to get the car to the docks, which will invariably need a local road haulage company to tow the car to the port. Organising this from the UK can be tricky – and our recommendation is to pay a bit extra and to use the transatlantic shipper to arrange the pickup themselves. We have been let down in the past by road hauliers not bothering to show up – but at least the shipping company has a $1500 vested interest in getting the car on the boat as quickly as possible! Often this cost can be added to your overall bill (which you pay when the car is back in the UK). When the transporters arrive to collect the car – the previous owner will need to hand them the bill of sale and the title documents (as the haulier will need to present these at the port). TOP TIP – make sure you get photocopies of the documents sent to you before they are handed over – they can easily get lost along the way! Also, make sure that there are no valuables or effects in the car before handing it over – as these can (and do) go missing along the way. Any paperwork, history, memorabilia, etc that comes with the car should be posted on separately if it is of any value. Finally, a BILL OF LADING will be completed, which states the condition of the car as it was when collected by the haulier. This will highlight any damage already on the car – and is mainly to protect the transporters against any claims that might arise from damage caused before the journey. An example bill of lading form, completed by the transporter. Damage to cars is unusual – but can happen – We’ve only seen it happen once, where the car moved around within a container and smashed the rear fascia and the exhaust back box….but don’t have nightmares – this isn’t common! Once export approval has been granted – the car will be placed in a compound at the docks and will shortly be loaded into a container and placed on a boat destined for the UK. At this point, US customs will stamp your title document as ‘Exported’ and will make preparations to update the US DMV database. The documents will then be airmailed over to you in the UK. About 4 to 5 weeks later…. The car will land in the UK and will need to undergo HMCE clearance. This is where they agree the VAT payable and work out the duty rate. At this point you need to complete the C384 form and send it back to the shipping agent. At this point, it is absolutely CRITICAL that you state the Place of Manufacture as Northern Ireland……This will ensure that the car is recognised as a re-import and will qualify for 0% duty tax (instead of 10%). You will however have to pay an administration fee of £50. The declared value of the car on your C384 form will also be used to calculate the VAT payable. Be aware that the VAT calculations are based on a ‘fair market value’ of the car – not necessarily the price you paid. Generally, the Customs & Excise teams will take the bill of sale price and/or the C384 form value and use that for calculation of VAT payable. 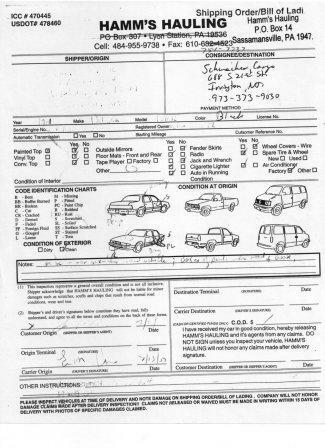 However, if you import a mint DeLorean with a bill of sale stating that you paid $1000 for the car – don’t expect to get away with it! HMCE will probably look at the legality of the bill of sale – and will hit you with VAT payable based on a deemed value (at their discretion) of the car. So be honest! Example Customs & Excise 384 form – with key fields highlighted. Essentially, you need to do 2 things here. 1. Be HONEST. Tell them the truth about what you paid, etc. Once import taxes are agreed and an invoice is issued to you (probably via the shipper) – you need to pay the HMCE charges before the car can be released to you. In some cases, your transporter will pay this on your behalf – and then add it to your bill. Expect a delay of around 5 days to get the car ‘cleared’. Once this is done, HMCE will stamp the front of the C&E 386 (Original) form saying that the VAT has been paid. Once cleared, your car will then be moved into a holding warehouse awaiting your collection. Note that you will be charged around £5 a day for storage – and this is payable only in CASH at the gate. You also need to inform them BEFORE showing up to collect the car. This is a bit tricky if you organise a pickup company to collect the car and bring it to you, as they will have to outlay cash to the warehouse and then hope that you will not rip them off! No matter what car you have bought – do NOT think about driving it home yourself. The car will not be registered in the UK; it will have no Tax and no MOT. Any insurance you may have arranged will be completely worthless (regardless of what the police or the DVLA may tell you). Ultimately, the decision whether to pay out in the event of an insurance claim resides with the insurance company – and they will have a host of reasons why your policy doesn’t cover you. At PJ Grady (Europe) they have official DVLA trade plates and fully comprehensive road risks insurance that allow them to legally move these cars around. You could save yourself a lot of heartache by giving them a ring. However, more importantly, you would be jumping into a car which is an unknown. You don’t know how good the braking system is, how reliable the car will be at speed or over any real distance and so on. Play safe and get a local haulier to collect the car for you – but expect to pay around £2 a mile….but well worth it. Step 6 – Get it on the road! Now the car is with you, the next step is to get it road worthy so you can start enjoying it! This could be anything from a day of effort to several years depending on how good/bad the car is! Don’t compromise on the fundamentals. A flashy stereo and new floor mats can be added later – make sure the brakes are checked and changed as a first port of call. Once the car is up to MOT standard, you will need to ensure that you fit Euro specification headlamps (the US lights dip to the right and would dazzle oncoming drivers) – and you need to fit a rear fog light (or modify the wiring in the existing cluster). As a 25+ year old car, VOSA will not explicitly test emissions – which is good, but make sure your tyres, brakes, handbrake and particularly your suspension/steering bushings and ball joints are up to scratch – these are the most common failures we see. Once you have your MOT and your insurance certificate, you need to contact the DVLA to send you form V55/5 – which you complete and send to your local DVLA office (not Swansea) along with a £50 first registration fee and £180 for your first tax disk. Note: The procedures for importing cars into the UK do change from time to time, so it is prudent to double check with the relevant authorities before committing to purchase your car. This information is provided for information only, and should not be used as an authoritative declaration of the ‘end to end’ import and export process. In all cases, if you are unsure please contact the relevant agent for further advice. P J Grady (Europe) for the benefit of our club members.